According to the newest Regional Project Report –“Solar Powering Taiwan: Special Report” by EnergyTrend , a division of TrendForce , 2018 will prove to be the most disastrous year for Taiwan’s solar PV manufacturers, yet the best year in terms of solar PV system installations downstream, bringing new installations up to 1GW for the first time in history. The government is now actively pushing towards a goal of 1.5GW in new installations by the end of 2019. 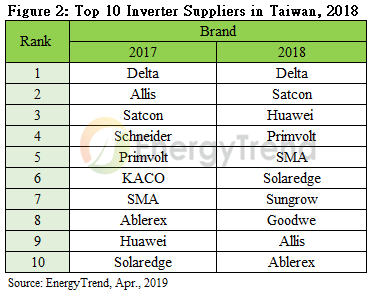 Judging from the rankings of and the positions taken up by module, inverter, downstream EPC contractors and bank and life insurance companies in 2018, EnergyTrend analyst Sharon Chen points out that though the market scale for PV systems aren’t as large as that of wind power, the PV market has already undergone a long formation process. Consider further the fact that PV charging stations have a relatively steady and high return on investment, and it’s not hard to see why even banks and life insurance firms are scrambling to claim a portion of this market. The module market of 2018 differed from 2017’s, which saw Neo Solar Power (NSP) and AU Optronics (AUO) as the leading double eagle. URE benefited greatly from its three-in-one strategy, with NSP as the surviving company combining both Gintech and Solartech to become the top contender by module shipments in Taiwan, 2018: It reached 500MW in total shipments, with market shares leaping from 30% in 2017 to 48% in 2018.